Try launching VIPM with "Run As Administrator" settings that you get by RightMouseClick or Shift+RightMouseClick. Although the article is not related to this specific issue, it explains how to set permissions during VIPM installation. But if you face the problem in future, try adding machine name and ip address. It sounds like some permissions issue. Try reinstalling VIPM with "Run As Administrator" settings that you get by RightMouseClick or Shift+RightMouseClick while launching VIPM Installer. Thanks for providing the error message. It appears to be a permissions issue. I will suggest to uninstall VIPM and Reinstall. 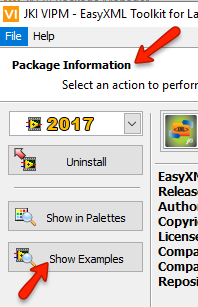 But, this time while reinstalling, I want you to RightMouseClick or Shift+RightMouseClick on VIPM Installer and select "Run As Administrator" option. I will suggest you to look at examples that ship with EasyXML Toolkit. Especially, the one called "Write and Read XML File.vi". Great! It was indeed one of the fixes implemented in VIPM 2017 SP1. Thanks for confirmation and glad to know that you were able to build the package successfully. How did you manage to solve the issue? It appears that the toolkit provider should be able to help you. ........ discovered a bad class library ownership relationship. Although one of my classes was directly placed within a lvlib, the class itself believed it was within a different lvlib, one that didn't even exist anymore. Despite this corruption, LabVIEW wasn't showing any errors, broken VIs or problems. I only discovered this when I started investigating one of the least well travelled routes with my code and saw some very odd behaviour with a DVR and an in-place structure on the class in question. .........resolving this class ownership issue appears to have resolved the problem in VIPM. I can only presume that the ownership corruption caused VIPM to get confused about which libraries to copy, open and close etc., or perhaps caused LabVIEW itself to fail to handle the libraries properly when closing the classes. Let me know if this helps or you have a different scenario. Apologies for missing out on these. We were able to reproduce the behaviour and have recorded as Case 17570 for VIPM team to take a look at. I will get back to you when there are more updates on this.